Like in poker, there’s always a tell. Before the most recent rally we’ve seen in U.S. stocks since August, aerospace & defense stocks were the group breaking out. It was hard to be bearish equities with this group — an important part of the industrials sector, and a leader among leaders — coming out of an eight-month base to new all-time highs. The aerospace & defense breakout was an important indicator for stocks as an asset class. Today I think technology is the tell. 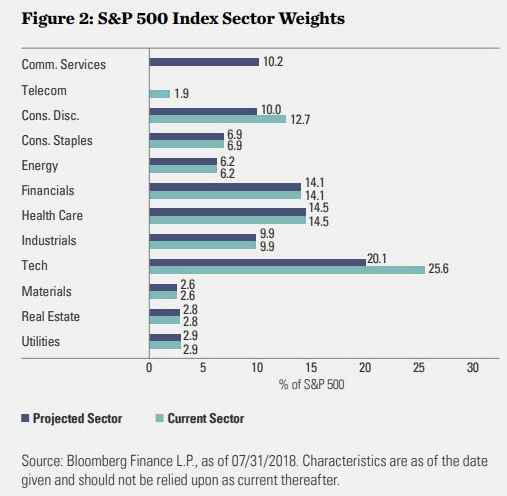 How the sector performs coming up should say a lot about this overall market. Just this week the Global Industry Classification Standard (GICS), the common standard used by thousands of market participants, made some changes. It announced that it was renaming the “telecom” sector to “communication services,” and the new sector will include media, internet, and direct marketing companies from the consumer discretionary group, as well as information technology components. After the changes, tech represents 20% of the S&P 500, which is still a large chunk, but down from the 26% it previously made up. It’s funny; strong markets do splits, not reverse splits. I’ll take this as a positive for tech. And if it’s not, then I think we have a problem. That’s what we’re looking at today. 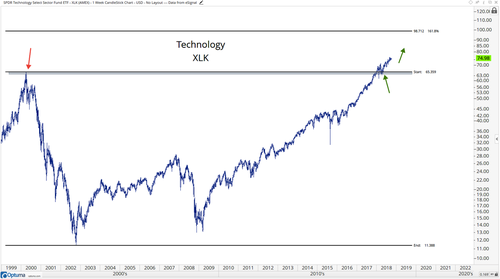 To be clear, I believe the higher probability outcome is an upside resolution in technology and we then continue to march to new all-time highs. As always, however, we want to accept ahead of time that we’re wrong and find the circumstances that will prove us wrong. 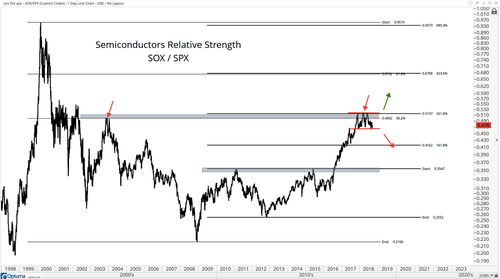 The consolidation we’re seeing in tech, and more specifically in semiconductors as an industry group, is a healthy and normal consolidation within an ongoing uptrend. If it’s not, that’s where the problems start. First, let’s put things in perspective. It took 18 years of absolutely no returns after the famous peak in March 2000. We’re only now breaking out of this multi-decade base. 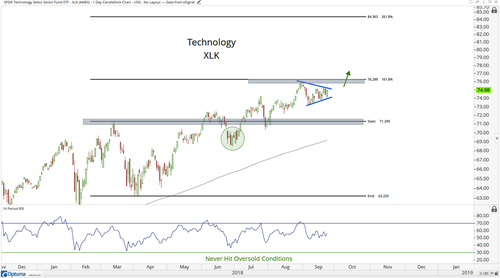 With that long-term trend in context, let’s take a short-term look at tech. The range for the SPDR Technology Sector Fund (NYSEArca: XLK) over the past month looks perfectly normal and should resolve in the direction of the underlying trend. 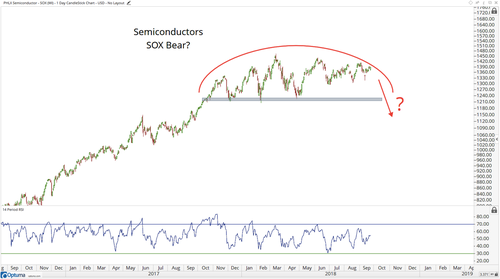 Now, here’s the big component one we want to focus on: semiconductors. 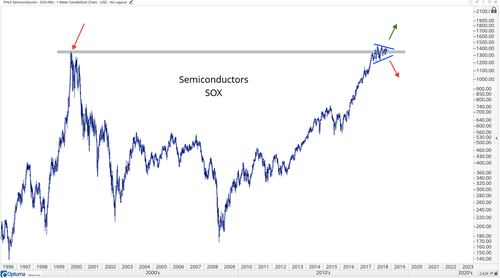 Like technology as a sector index, semis have gone absolutely nowhere for 18 years, ever since that March 2000 peak. If we’re correct in our assessment, that yes, we’re in fact just getting started, then this consolidation in semis needs to resolve itself to the upside. Taking out $1,410 would be the first step in proving we’re getting an upside resolution. 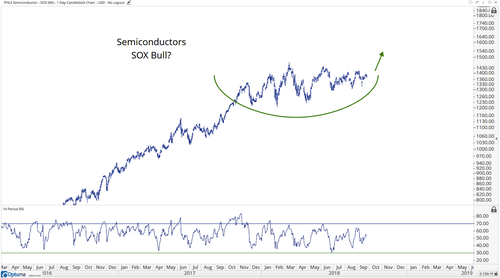 Weekly closes in the PHLX Semiconductor Index (SOX) above $1,432 would be even more conclusive. From a risk-management standpoint , which is most important, holding above $1,300 is the big level. If we’re below, $1,300 we have bigger problems on our hands in semis, and therefore technology and the rest of the U.S. stock market. Here’s the bear case. Does this range in semis look like a massive top? Or does this just look like a consolidation within an ongoing uptrend? Now, on a relative basis is where things get interesting. To suggest this market is “overextended” or in its “late cycle” or any of that nonsense they’ve been feeding you, is just irresponsible in my opinion. Notice how on a relative basis, we’re nowhere near those March 2000 highs. In fact, we’ve barely retraced 38.2% of that entire decline. This also points to us that we’re just getting started in this bull market and nowhere near the later innings. Let’s take a look at the semis-versus-S&P 500 ratio in a range all year near some important retracement and extension levels. The resolution from this range will be very telling for the next direction of semi and, say it with me, tech and U.S. stocks. New highs or new lows will be our tell. A rip here on a relative basis would take the price on an absolute basis though the upper end of the range and on to new all-time highs. In fact, today I just recommended to Breakout Profits readers a mobile payments stock I think will benefit from what I see coming. It’s got a clear risk versus reward setup and its recent strength has gotten my attention.